In Marti Perarnau’s excellent book ‘Pep Confidential’, the manager himself states he had two favourite performances from his time in the Catalonian city of Barcelona – A 2010 win against Arsenal and their victory over Neymar’s Santos in the Club World Cup match of 2011. Barcelona’s shape in the final. Continuing in the retrospective form of Spielverlagerung’s articles recently thanks to the resurrection of AO, I will be looking at the latter as Barca sunk the Brazilian giants 4-0. It was Guardiola’s last season in charge of the superteam he had created, and he looked to add one of the 4 trophies he would go on to win that season. Although it is technically a match for the highest honour in club football, the team was unsurprisingly lopsided in quality. Despite possessing the brilliantly talented Neymar, Santos were clearly overpowered by the collective and individual excellence which Pep had developed. Something well documented on by Spielverlagerung, most notably by AO and RM, is the footballing concept of Juego de Posicion. The idea provides a framework for a team to play in possession as they look to establish superiority over their opposition. Guardiola’s famous use of positional play is very much evident in this match as it helps his side achieve an excellent positional structure allowing them to both dominate possession and more importantly, utilise it as a tool to great effect. With Xavi, Iniesta, Fabregas and Messi possession very flexible roles in their positioning, Barce were able to co-ordinate their movements to a highly effective level in order to destabilise the Santos defence. Amongst themselves they could combine through defensive pressure, supported positionally by the stretching presence of Thiago and Alves. Credit must also be given to footballing-god Busquets too, who is perhaps the only player in the world who could perform such a role and most definitely to such a level. With already a back 3, the 6 would only situationally drop amongst the defenders and instead stayed on the next line offering for connections and supporting the circulation through the middle. His supremely-intelligent positioning was important too in opening passing lanes as well as providing extra space for the dropping movement of Xavi. A key strength from positional play is that a team’s connections in possession are stronger and thus ball circulation can improve. With better connections between players, the ball can be moved more efficiently, with greater effectiveness and under a higher level of stability. A common pattern in Barcelona’s possession game was their switches of the ball from half-space to half-space. The action of switching possession is largely known for moving the ball to the wing via a long, Gerrard-like (no, that is not a compliment) pass. However, Barcelona used switches from one half-space to the other very well as a way of progressing the ball through midfield. Using their positional play as a guideline, they would often overload the ball-far half-space and then switch the ball through a flat, diagonal pass to work around the oppositional midfield line. Unlike a switch to the wing, this pattern allows Barcelona to bypass the pressure of the midfield whilst still maintaining a strong ball position. 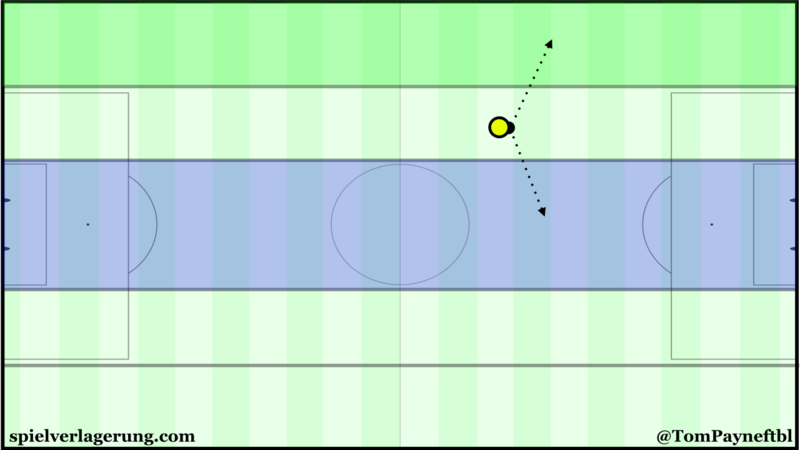 The diagonal nature of the passing itself is beneficial as it allows the ball to still move towards goal, whereas horizontally there would be no increased pressure. In addition to this, it reduces the opposition’s ability to recover the position and space in front of the defence as the ball not only moves laterally past them, but behind them too. The resulting position of the ball in the half-space is also a strong one. As I said, this switch allows them to bypass midfield pressure but still maintain a strong position and from the half-space, with a good field of view, passing angles and attacking variability. The half-space is next to a wing and the centre. The differences between the spaces provide strategical variability in attack. Sometimes they would make a switch to a flank, where either Alves or Thiago were positioned to attack a 1v1. This was more common with Alves who had more direct movement against the Santos defence, whilst Thiago was more oriented towards combinations and supporting the integration of Iniesta particularly. During these moments however, it was very rare that they would look to cross the ball. Alternatively, they would look to either bring the ball back inside through a deeper option, looking to ‘reset’ the possession and move inside to attempt more promising means of chance creation. Another option would be a low pass into the penalty area which is exactly what happened for the 2nd goal. Taking this option over a floated cross is in many situations the better option, with shots from danger zone passes holding a much higher conversion rate than crosses to the same location. Throughout his final year at the Camp Nou especially, Guardiola experimented with his side’s shape and would vary on a common basis. He particularly took to a 3-man defensive line with Abidal alongside Pique and Puyol which facilitated an extra midfielder in the side to further extend their ability to destroy teams through the middle. With both Messi and Fabregas commonly high in the shape, fans often referred to it as a 3-7-0 formation with no true forward as Messi dropped deep. However there is enough evidence to provide a strong argument to this suggestion. It is highly possible that people made this assumption based on the extreme levels of possession dominance and the typical connotations of the phrase ‘tiki-taka’. By the majority of people, they made assume that considering Barcelona frequently achieved over 70% possession and play so well through the midfield, they “must just put everyone in midfield”. With Lionel Messi being the only recognised striker and his well-known ‘false 9’ role will also have an influence. Another argument against the use of formations to denote Barcelona is that it rarely is correct when in possession, especially in the case of Barcelona. Guardiola’s side were extremely flexible which meant that the side rarely resembled anything under the restrictions of a formation. 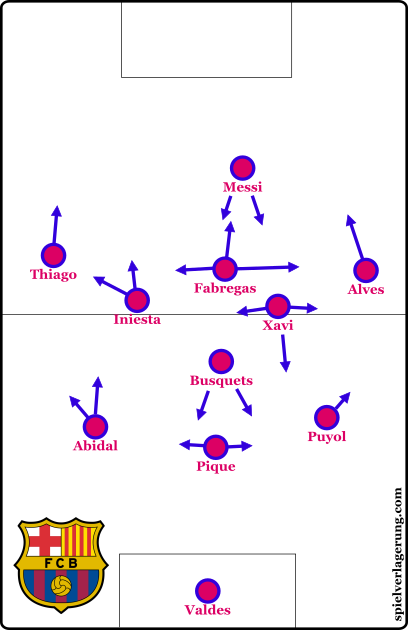 Across the midfield, Xavi, Iniesta and Fabregas had variable roles which saw them occupy numerous different lines of positioning. Although one can give an estimate of a rough ‘standard’ position, using a formation would be disregarding the fluidity of the attacking movements. Instead of the 3-7-0 idea, a more accurate proposal could be a 3-6-1. Despite his false 9 role, it would be inaccurate to consider Messi as a midfielder along with the likes of Busquets and Xavi. Aside from the forward, one could argue that the wingers do not belong in the midfield ‘7’, especially the direct-moving Alves. Finally, ahead of the defensive line Busquets’ role is quite unique to his other midfielders and being positioned on often a separate line between the two main banks, could warrant a ‘1’ denoting his position. Considering the above, we could possibly refer to the shape as more of a 3-1-3-3 as opposed to the 3-6-1. Either way, both are more accurate in depicting Barcelona’s unusual shape which has clear resemblances to that of Barcelona’s shape under Cruijff and Van Gaal. Barcelona’s performance against Santos was undoubtedly special with the team yet again showing why they are regarded as one of the best ever. There is little doubt that they are unrivalled as the best team in modern football, whilst they can certainly be considered amongst the best we have ever seen in the history of the sport. The 2011 team is considered the best of Guardiola’s time in Barcelona and the side who dominated Santos were certainly at the height of their powers. This 3-6-1 formation was indeed very special, but Guardiola was not the first coach who intruduced it. In 1986 Argentina played in the World Cup final against West-Germany with comparable tactics. Maradona played nearly in the same position as Fabregas between midfield and front, but sometimes a little bit deeper. In 1999 Olympique Marseille played in the UEFA Cup final against AC Parma with this system, but they lost 3-0. The French hadn’t players like Fabregas or Maradona.